Love the models. Really like the direction they are going with for GSC. I also like how even the smaller vehicles in 8th are survivable past a single hit. Makes them worthwhile for the first time in ages. This army is going to drain my wallet. ...but I can't because I'm saving up for the eventual Sisters releases. Land Speeders still fold like silk handkerchiefs, being T5 / 3+ / W6 and they Explode! But, for the most part, I’m quite happy with the way this edition treats light vehicles. 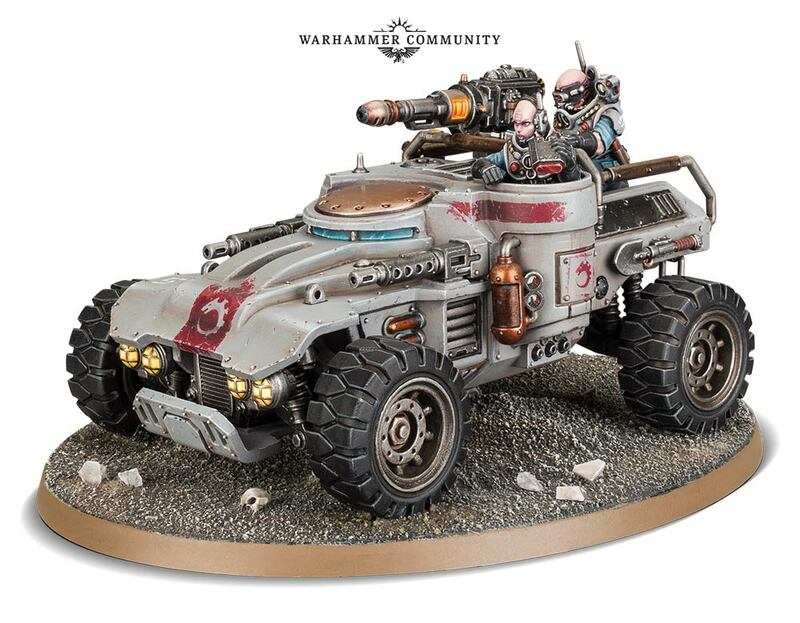 I want to pick up a Goliath (or two), some Servohaulers, and maybe some of these new Ridgerunners and demilitarize them. 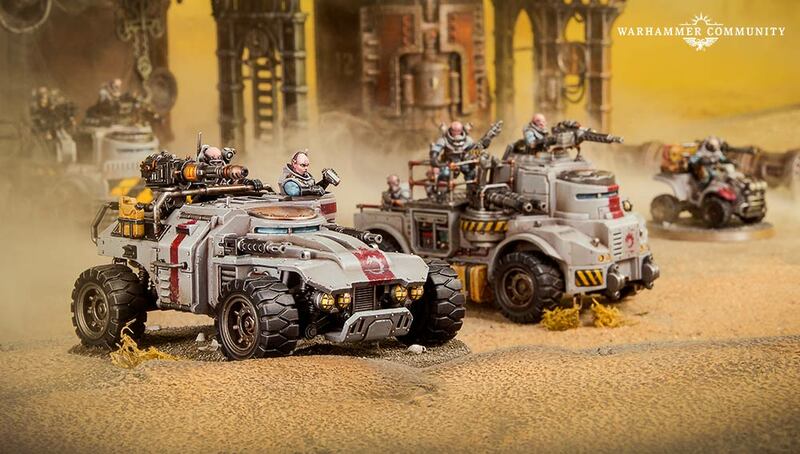 Turning them back into civilian vehicles, they’d make great terrain for Kill Team or Cityfight. I'm planning on making the weapons and crew on mine removable, so I can just use them as Terrain for KT or Necromunda or whatever. More generally, this release just keeps looking better and better. Can't wait to get my hands on them, even tho I already have way too many projects going already. 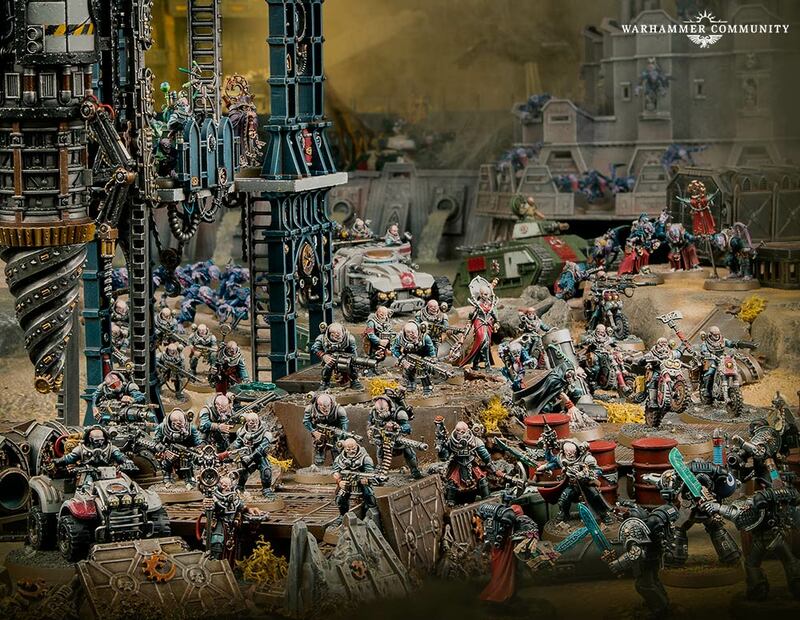 Codex next week with bikes and Char. and Drill. Women!? 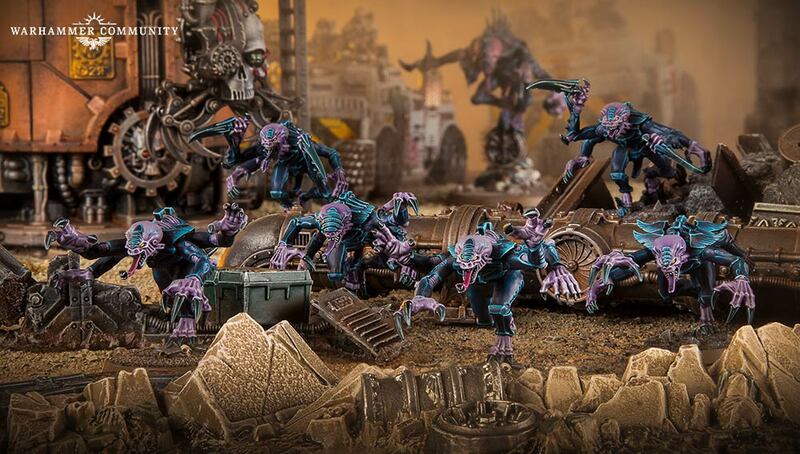 The Genestealers are going to give us all cooties! God-Emperor protect us from these foul alien creatures! Essentially, each time one of your Characters fails a saving throw or suffers a mortal wound, and is within 3″ of a friendly Genestealer Cults unit with the Unquestioning Loyalty ability, you can roll a dice. On a roll of 4+, a model from the nearby unit is slain but your Character remains unharmed! This is a huge advantage* for lightly armoured characters who may otherwise be prime targets for enemy sniper units. Should your precious Character suffer a few wounds despite this, it’s nothing that the Hyber-metabolism Stratagem can’t fix! 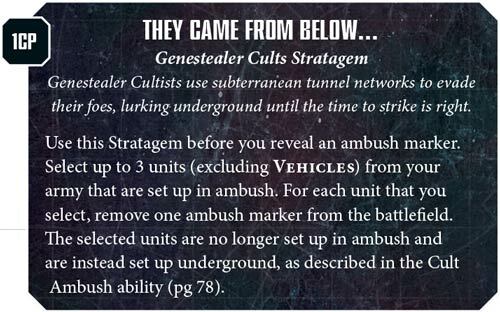 Setting Up Underground: During deployment, you can set up Infantry and Bike units with the Cult Ambush ability underground. 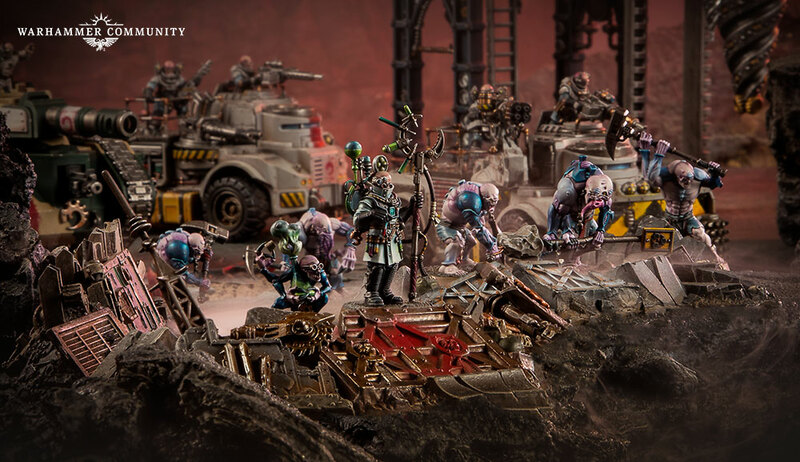 At the end of any of your Movement phases, some or all of these units can emerge anywhere on the battlefield that is more than 9″ from enemy models. The freedom you’ll have to suddenly strike your opponent’s forces in great force from any direction will cause mayhem with their battleplans. Instead of setting up a unit underground or on the battlefield, you can choose to place an ambush marker anywhere within your deployment zone. You can place a marker for each unit you choose to set up an ambush – even Transports and larger Vehicles such as a Cult Leman Russ can be set up in this manner! The crucial detail here is that you don’t need to assign which units are represented by each ambush marker – you can decide that later. 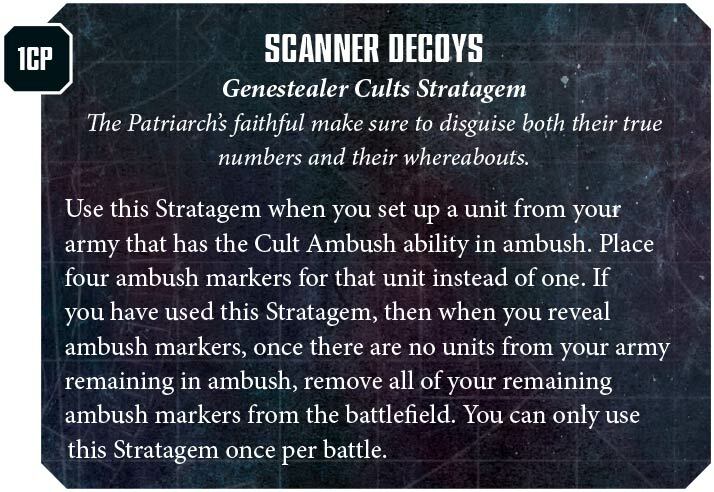 There is also a sneaky Stratagem that enables you to place additional ambush markers to further confound your opponent. 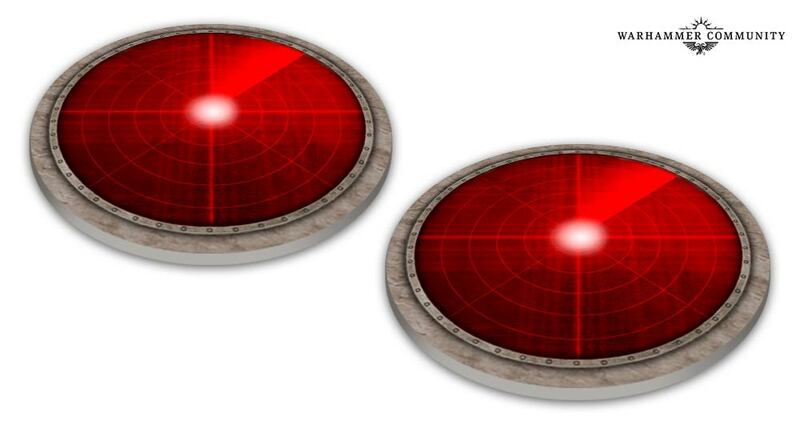 If you have the first turn, you reveal all of your ambush markers at the start of your first Movement phase. 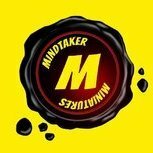 If your opponent goes first, you instead reveal all of your ambush markers at the end of their first Movement phase, and they cannot move anywhere within 9″ of any ambush markers beforehand. 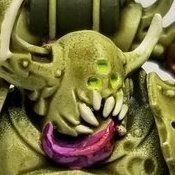 These markers are revealed one at a time – each time you do so, you select one unit from your army that you set up in ambush, then set up one model from that unit within 1″ of that ambush marker, followed by any other models in the unit. All units set up in this manner must be wholly within your deployment zone – that is, unless you further mess with your opponent by changing the nature of your ambush. 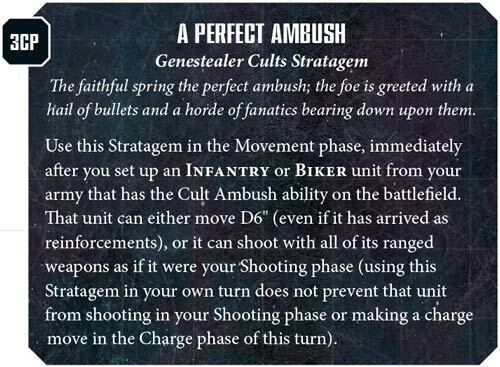 Revamped "Cult Ambush" rules seem really interesting! Not nearly as much of a "I win / I loose" dice roll as it was before. The "Perfect Ambush" strat still gives you the option of putting down a big unit of Genestealers or Aberrants where you need them and having a pretty good chance of getting off the charge. The tokens count as a screen..... They. Count. As. A. Screen. That is bonkers good!!! 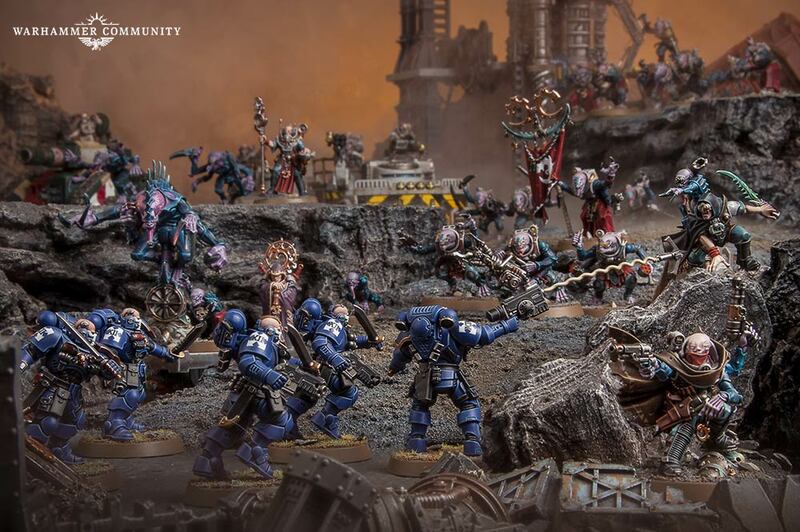 I’m loving the Genestealer Cult. 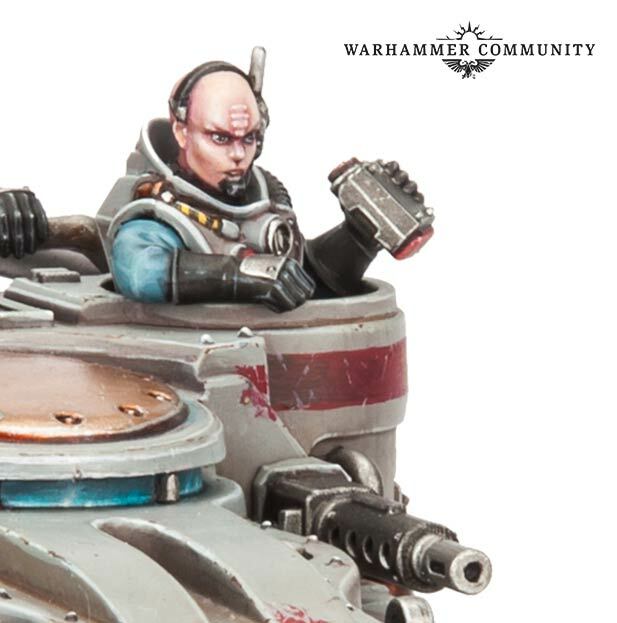 GW seems to have finally realized that “more different guns” isn’t the only way to make a distinction between factions. 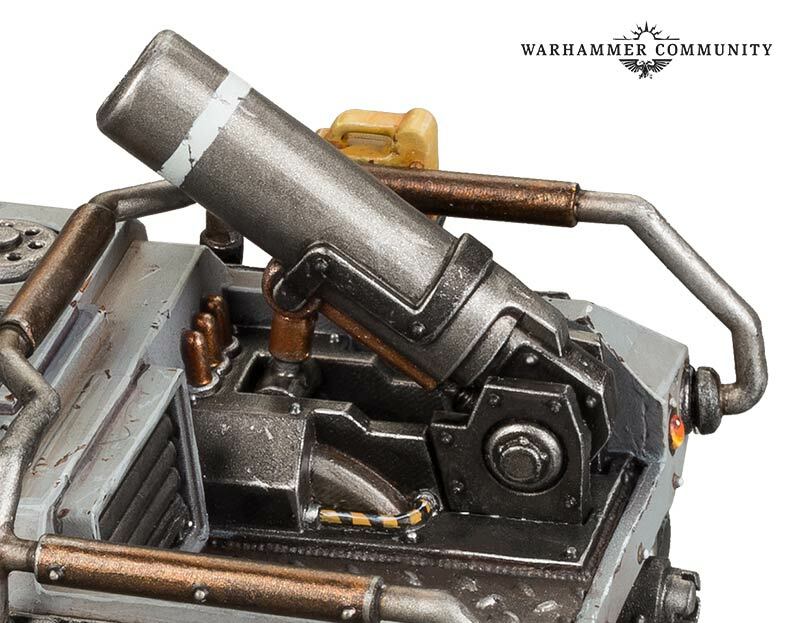 I wonder how deployment works for the 9" rule. Can I infiltrate deploy within 9" of an ambush token? If I can, and I go first, am I prevented from moving at all that turn, since I'm already violating the 9" cant move into zone? 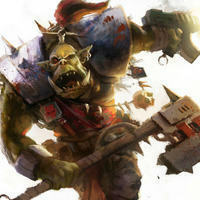 Oh, please, like anyone in the Games Workshop fandom has ever let “logic” and “reason” stop them from complaining about something GW did (or did not) do. 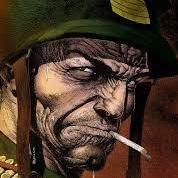 I love infiltrators, vanguard moves, Kunnin' but Brutal... really, any deployment-related shenanigans. GSC are irresistible. 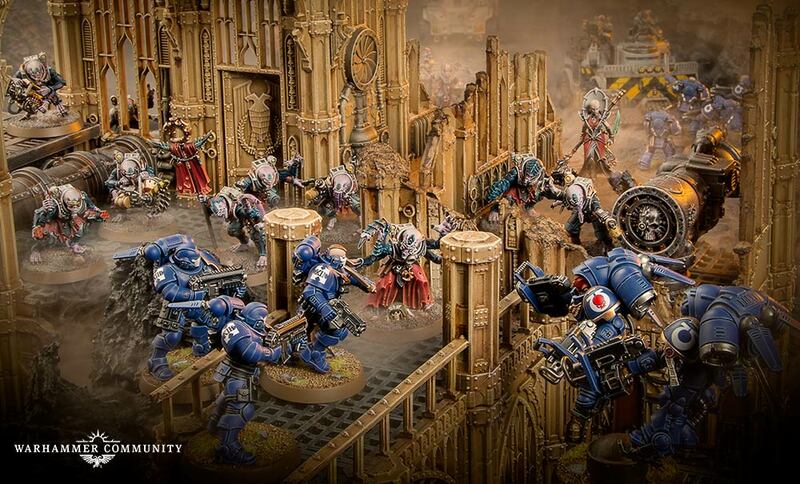 Bloody GW and their cool stuff.